Islamic Civilization Museum in Sharjah, UAE. Islamic Civilization Museum in Sharjah, UAE. Barjeel Art Foundation, UAE. Sketch by the Artist, depicting the location of the figure explained below. 1)ʾAbū l-Walīd Muḥammad bin ʾAḥmad bin Rušd: commonly known as Ibn Rushd or by his Latinized name Averroës (/əˈvɛroʊ.iːz/; April 14, 1126 – December 10, 1198), was an Andalusian Muslim polymath, a master of Aristotelian philosophy, Islamic philosophy, Islamic theology, Maliki law and jurisprudence, logic, psychology, politics and Andalusian classical music theory, and the sciences of medicine, astronomy, geography, mathematics, physics and celestial mechanics. Averroes was born in Córdoba, Al Andalus, present-day Spain, and died in Marrakesh, present-day Morocco. He was interred in his family tomb at Córdoba. The 13th-century philosophical movement based on Averroes' work is called Averroism. Averroes was a defender of Aristotelian philosophy against Ash'ari theologians led by Al-Ghazali. 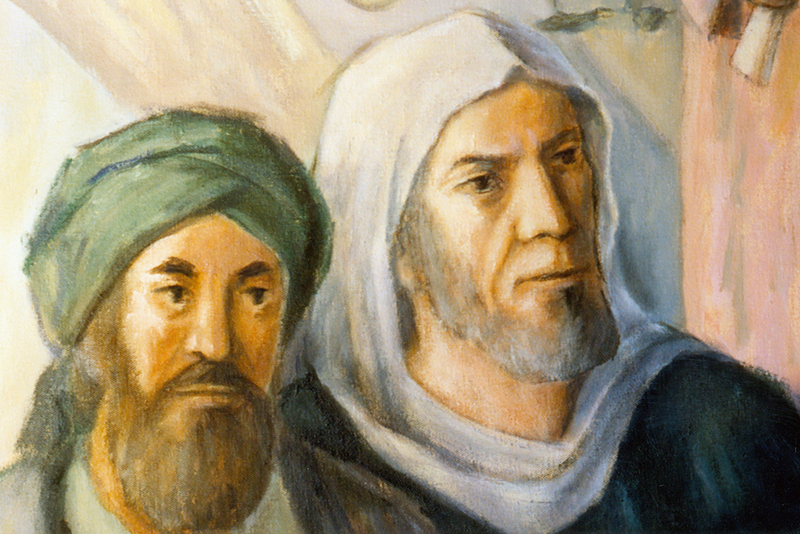 Averroes' philosophy was considered controversial in Muslim circles. 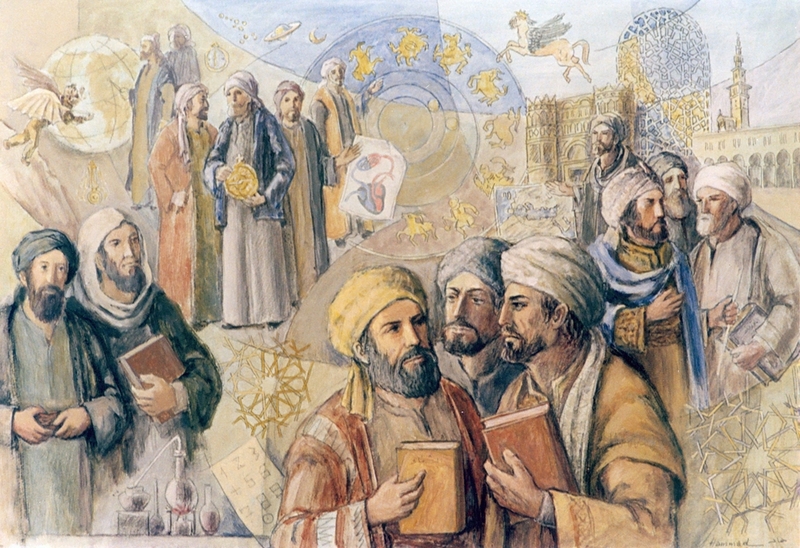 Averroes had a greater impact on Western European circles and he has been described as the "founding father of secular thought in Western Europe". The detailed commentaries on Aristotle earned Averroes the title "The Commentator" in Europe. Latin translations of Averroes' work led the way to the popularization of Aristotle and were responsible for the development of scholasticism in medieval Europe. 2) Pūr Sinɑʼ or Pur-e Sina; [ˈpuːr ˈsiːnɑː] "son of Sina"; August c. (980 – June 1037), commonly known as Ibn Sīnā, or in Arabic writing Abū ʿAlī al-Ḥusayn ibn ʿAbd Allāh ibn Al-Hasan ibn Ali ibn Sīnā or by his Latinized name Avicenna, was a Persian polymath, who wrote almost 450 works on a wide range of subjects, of which around 240 have survived. In particular, 150 of his surviving works concentrate on philosophy and 40 of them concentrate on medicine. His most famous works are The Book of Healing, a vast philosophical and scientific encyclopedia, and The Canon of Medicine, which was a standard medical text at many medieval universities. The Canon of Medicine was used as a textbook in the universities of Montpellier and Leuven as late as 1650. Ibn Sīnā's Canon of Medicine provides an overview of all aspects of medicine according to the principles of Galen (and Hippocrates). His corpus also includes writing on philosophy, astronomy, alchemy, geology, psychology, Islamic theology, logic, mathematics, physics, as well as poetry. He is regarded as the most famous and influential polymath of the Islamic Golden Age. 3) Al-Farabi: Abū Naṣr Muḥammad ibn Muḥammad Fārābī; known in the West as Alpharabius (c. 874 in Fārāb to 950), was a renowned scientist and philosopher of the Islamic Golden Age. He was also a cosmologist, logician, and musician. Through his commentaries and treatises, Al-Farabi became well known among medieval Muslim intellectuals as "The Second Teacher", that is, the successor to Aristotle, "The First Teacher". The existing variations in the basic accounts of al-Farabi's origins and pedigree indicate that they were not recorded during his lifetime or soon thereafter by anyone with concrete information, but were based on hearsay or guesses (as is the case with other contemporaries of al-Farabi).The sources for his life are scant which makes the reconstruction of his biography beyond a mere outline nearly impossible.The earliest and more reliable sources,those composed before the 6th/12th century, that are extant today are so few as to indicate that no one among Fārābī’s successors and their followers, or even unrelated scholars, undertook to write his full biography, a neglect that has to be taken into consideration in assessing his immediate impact. The sources prior to the 6th/12th century consist of: (1) an autobiographical passage by Farabi, preserved by Ibn Abī Uṣaibiʿa. In this passage, Farabi traces the transmission of the instruction of logic and philosophy from antiquity to his days. (2) Reports by Al-Masudi, Ibn al-Nadim and Ibn Hawqal as well as by Said Al-Andalusi (d. 1070), who devoted a biography to him. في بداية القرن العاشر الميلادي، كانت هوية وأعمال جابر بن حيان مثار جدل كبير في الأوساط الإسلامية. وكانت كتبه في القرن الرابع عشر من أهم مصادر الدراسات الكيميائية وأكثرها أثراً في قيادة الفكر العلمي في الشرق والغرب، وقد انتقلت عدة مصطلحات علمية من أبحاث جابر العربية إلى اللغات الأوروبية عن طريق اللغة اللاتينية التي ترجمت أبحاثه إليها .وصفه ابن خلدون في مقدمته وهو بصدد الحديث عن علم الكيمياء فقال: «إمام المدونين جابر بن حيان حتى إنهم يخصونها به فيسمونها علم جابر و له فيها سبعون رسالة كلها شبيهة بالألغاز».قال عنه أبو بكر الرازي في «سر الأسرار» :«إن جابراً من أعلام العرب العباقرة وأول رائد للكيمياء»، وكان يشير إليه باستمرار بقوله الأستاذ جابر بن حيان. وذكر ابن النديم في الفهرست مؤلفاته ونبذه عنه، وقال عنه الفيلسوف الإنكليزي فرانسيس بيكون: "إن جابر بن حيان هو أول من علّم علم الكيمياء للعالم، فهو أبو الكيمياء"، وقال عنه العالم الكيميائي الفرنسي مارسيلان بيرتيلو في كتابه (كيمياء القرون الوسطى): "إن لجابر بن حيان في الكيمياء ما لأرسطو في المنطق"
4) Abu Mūsā Jābir ibn Hayyān Persian: جابرحیان‎, often given the nisbahs , l-Azdi, al-Kufi, al-Tusi or al-Sufi; fl.c.721–c.815) was a prominent Muslim polymath: a chemist and alchemist, astronomer and astrologer, engineer, geographer, philosopher, physicist, and pharmacist and physician. Born and educated in Tus, he later traveled to Kufa. Jābir was a alchemist. Jabir's name indicates that he was a Muslim. ٥) أبو بكر محمد بن يحيى بن زكريا الرازي عالم وطبيب فارسي (ح. 250 هـ/864 م - 5 شعبان 311هـ/19 نوفمبر 923 م)، ولد في مدينة الري. وهو أحد أعظم أطباء الإنسانية على الإطلاق كما وصفته زجريد هونكه في كتابها شمس الله تسطع على الغرب حيث ألف كتاب الحاوي في الطب كان يضم كل المعارف الطبية منذ أيام الإغريق حتى عام 925م وظل المرجع الطبي الرئيسي في أوروبا لمدة 400 عام بعد ذلك التاريخ. درس الرياضيات والطب والفلسفة والفلك والكيمياء والمنطق والأدب.ومن أعظم كتبه "تاريخ الطب" وكتاب "المنصور" في الطب وكتاب "الأدوية المفردة" الذي يتضمن الوصف الدقيق لتشريح أعضاء الجسم. هو أول من ابتكر خيوط الجراحة، وصنع المراهم، وله مؤلفات في الصيدلة ساهمت في تقدم علم العقاقير. وله 200 كتاب ومقال في مختلف جوانب العلوم. 5) Muhammad ibn Zakariyā Rāzī(Persian: محمد زکریای رازی‎ Mohammad-e Zakariā-ye Rāzi, also known by his Latinized name Rhazes or Rasis) (864 CE – 923 CE), was a Persian polymath, physician, alchemist and chemist, philosopher and important figure in the history of medicine and as the discoverer of alcohol and vitriol (sulfuric acid) is well known. Being endowed by nature with a comprehensive mind, Razi made fundamental and enduring contributions to various fields of science, which he recorded in over 200 manuscripts, and is particularly remembered for numerous advances in medicine through own observations and discoveries. An early proponent of experimental medicine, he became a successful doctor; was appointed a court physician, and served as chief physician of Baghdad and Rey hospitals. He was among the first to use Humoralism to distinguish one contagious disease from another and has been described as doctor's doctor, the father of pediatrics, and a pioneer of ophthalmology. As a practicing physician, Razi wrote a pioneering book about smallpox and measles providing clinical characterization of the diseases. Through translation, his medical works and ideas became known among medieval European practitioners and profoundly influenced medical education in the Latin West. Some volumes of his work Al-Mansuri, namely "On Surgery" and "A General Book on Therapy", became part of the medical curriculum in Western universities. As a teacher of medicine, he attracted students of all backgrounds and interests and was said to be compassionate and devoted to the service of his patients, whether rich or poor. 6) Ibn Khaldūn (: Abū Zayd ‘Abdu r-Raḥmān bin Muḥammad bin Khaldūn Al-Ḥaḍrami; May 27, 1332 AD/732 AH – March 19, 1406 AD/808 AH) was an Arab Muslim historiographer and historian, regarded to be among the founding fathers of modern historiography, sociology and economics. He is best known for his book The Muqaddimah (known as Prolegomena in Greek). The book influenced 17th-century Ottoman historians like Ḥajjī Khalīfa and Mustafa Naima who used the theories in the book to analyze the growth and decline of the Ottoman Empire. 19th-century European scholars also acknowledged the significance of the book and considered Ibn Khaldun as one of the greatest philosophers to come out of the Muslim world. 7)Abu al-Fida or Abul-Fida' al-Ḥamawi or Abul Fida Ismail Hamvi (fully Abu Al-fida' Isma'il Ibn 'ali ibn Mahmud Al-malik Al-mu'ayyad 'imad Ad-din, (also transliterated Abulfeda, Abu Alfida, and other ways)) (November 1273 – October 27, 1331) was a Kurdish historian, geographer, and local governor of Hamāh. He was a prince of the Ayyubid dynasty and the author of The memoirs of a Syrian prince: Abu'l-Fidāʼ, Sultan of Ḥamāh. The crater Abulfeda on the Moon, is named after him. Abu'l-Fida was born in Damascus, where his father Malik ul-Afdal, brother of emir Al-Mansur Muhammad II of Hama, had fled from the Mongols. In his boyhood he devoted himself to the study of the Qur'an and the sciences, but from his twelfth year onward, he was almost constantly engaged in military expeditions, chiefly against the crusaders. In 1285 he was present at the assault of a stronghold of the Knights of St. John, and took part in the sieges of Tripoli, Acre and Qal'at ar-Rum. In 1298 he entered the service of the Mamluk Sultan Malik al-Nasir and after twelve years was invested by him with the governorship of Hama. In 1312 he became prince with the title Malik us-Salhn, and in 1320 received the hereditary rank of sultan with the title Malik ul-Mu'ayyad. For more than twenty years all together he reigned in tranquillity and splendour, devoting himself to the duties of government and to the composition of the works to which he is chiefly indebted for his fame. He was a munificent patron of men of letters, who came in large numbers to his court. He died in 1331. 8) Ali ibn al-Hasan ibn Hibat Allah ibn `Abd Allah, Thiqat al-Din, Abu al-Qasim, known as Ibn `Asakir al-Dimashqi al-Shafi`i al-Ash`ari. Born in Damascus,1105 during the reign of atabeg Toghtekin, 'Asakir received an extensive education, as befitting someone from a wealthy family. By 1120, he was attending lectures of al-Sulami at the Shafi'i madrasa, which was built by atabeg Gumushtegin. He traveled to Baghdad, following the death of his father, and went on hajj in 1127. He returned to Baghdad to hear lectures at the Nezamiyeh, from Abu l'Hasan al Ansari(a pupil of al-Ghazali), lectures on the hadith of Abi Salih al-Karamani and Ibn al-Husayn Abu l'Kasim. By 1132, Asakir returned to Damascus being married within the year. Civil disturbances forced him to leave Damascus and travel from Isafahan to Merv, where he met Abu Sa'd 'Abd al-Karim al-Samani. With al-Samani he travel to Nishapur and Herat and by 1139 he had passed through Baghdad on his way back to Damascus. Throughout his journey he collected numerous hadiths and had become a hafiz. Under the patronage of Nur ad-Din Zangi, Asakir wrote the Tarikh Dimashiq. In 1170, Nur al-Din built the madrasa Dar al-Hadith for Asakir. History of Damascus (Arabic: Tarikh Dimashiq) is one of most important books about the Islamic history of Syria, covering the life of important figures who resided in or visited Damascus. That is not limited to the assessment of narrators of hadith, Ilm ar-Rijal, but also includes historical and political figures. When it comes to Islamic figures, Ibn Asakir tried to collect everything that has been said about that figure, true or false, with full chain of narration. It also contains a huge collection of Arabic poems. It was printed recently in seventy two volumes. 9) Abu Abd Allah Muhammad al-Idrisi al-Qurtubi al-Hasani al-Sabti or simply Al Idrisi (Latin: Dreses) (1100–1165 or 1166) was a Muslim geographer, cartographer, Egyptologist and traveller who lived in Sicily, at the court of King Roger II. Muhammed al-Idrisi was born in Ceuta, then belonging to the Moroccan Almoravids, and died in Sicily. Al Idrisi was a descendant of the Idrisids, who in turn were descendants of Hasan bin Ali, the son of Ali and the grandson of the Islamic prophet Muhammad. Al-Idrisi was born into the large Hammudid family of North Africa and Al-Andalus, which claimed descent from the Idrisids of Morocco and ultimately the prophet Muhammad. Al-Idrisi incorporated the knowledge of Africa, the Indian Ocean and the Far East gathered by Islamic merchants and explorers and recorded on Islamic maps with the information brought by the Norman voyagers to create the most accurate map of the world in pre-modern times, which served as a concrete illustration of hisKitab nuzhat al-mushtaq, (Latin: Opus Geographicum), which may be translated A Diversion for the Man Longing to Travel to Far-Off Places. The Tabula Rogeriana was drawn by Al-Idrisi in 1154 for the Norman King Roger II of Sicily, after a stay of eighteen years at his court, where he worked on the commentaries and illustrations of the map. The map, with legends written in Arabic, while showing the Eurasian continent in its entirety, only shows the northern partof the African continent and lacks details of the Horn of Africa and Southeast Asia. Al-Idrisi inspired Islamic geographers such as Ibn Battuta, Ibn Khaldun and Piri Reis. His map also inspired Christopher Columbus and Vasco Da Gama. 10) Khawaja Muhammad ibn Muhammad ibn Hasan Tūsī (Persian): ‎ (born 17 February 1201 in Ṭūs, Khorasan – died on 25 June 1274 in al-Kāżimiyyah district of metropolitan Baghdad), better known as Nasīr al-Dīn Tūsī (Persian: ‎; or simply Tusi in the West), was a Persian polymath and prolific writer: An architect, astronomer, biologist, chemist, mathematician, philosopher, physician, physicist, scientist, theologian and Marja Taqleed. Muslim scholar Ibn Khaldun (1332–1406) considered Tusi to be the greatest of the later Persian scholars. Nasir al-Din Tusi was born in the city of Tus in medieval Khorasan (in north-eastern Iran) in the year 1201 and began his studies at an early age. In Hamadan and Tus he studied the Qur'an, logic, philosophy, mathematics, medicine and astronomy. He lost his father at a young age. Fulfilling the wish of his father, the young Muhammad took learning and scholarship very seriously and travelled far and wide to attend the lectures of renowned scholars and acquire the knowledge which guides people to the happiness of the next world. At a young age he moved to Nishapur to study philosophy under Farid al-Din Damad and mathematics under Muhammad Hasib. He met also Farid al-Din 'Attar, the legendary Sufi master who was later killed by Mongol invaders and attended the lectures of Qutb al-Din al-Misri. In Mosul he studied mathematics and astronomy with Kamal al-Din Yunus (d. 639/1242). Later on he corresponded with Sadr al-Din al-Qunawi, the son-in-law of Ibn al-'Arabi, and it seems that mysticism, as propagated by Sufi masters of his time, was not appealing to his mind and once the occasion was suitable, he composed his own manual of philosophical Sufism in the form of a small booklet entitled Awsaf al-Ashraf "The Attributes of the Illustrious". As the armies of Genghis Khan swept his homeland, he was captured by the Ismailis and made his most important contributions in science during this time when he was moving from one stronghold to another. He finally joined Hulagu Khan's ranks, after the invasion of the Alamut castle by the Mongol forces.His books are in Arabic and Persian . 11) Ala-al-din abu Al-Hassan Ali ibn Abi-Hazm al-Qarshi al-Dimashqi (1213-1288) known as Ibn al-Nafis was an Arab physician who is mostly famous for being the first to describe the pulmonary circulation of the blood. He was born in 1213 in Damascus. He attended the Medical College Hospital (Bimaristan Al-Noori) in Damascus. Apart from medicine, Ibn al-Nafis learned jurisprudence, literature and theology. He became an expert on the Shafi'i school of jurisprudence and an expert physician. In 1236, Al-Nafis moved to Egypt. He worked at the Al-Nassri Hospital, and subsequently at the Al-Mansouri Hospital, where he became chief of physicians and the Sultan’s personal physician. When he died in 1288, he donated his house, library and clinic to the Mansuriya Hospital. The most voluminous of his books is Al-Shamil fi al-Tibb, which was planned to be an encyclopedia comprising 300 volumes, but was not completed as a result of his death in 1288 . The manuscript is available in Damascus. His book on ophthalmology is largely an original contribution. His most famous book is The Summary of Law (Mujaz al-Qanun). Another famous book, embodying his original contribution, was on the effects of diet on health, entitled Kitab al-Mukhtar fi al-Aghdhiya. His Al-Risalah al-Kamiliyyah fil Siera al-Nabawiyyah, translated in the West under the title Theologus Autodidactus, has been argued to be both the first theological novel and the first science fiction novel. He also wrote a number of commentaries on the topics of law and medicine. His commentaries include one on Hippocrates' book, and several volumes on Avicenna's The Canon of Medicine. Additionally, he wrote a commentary on Hunayn Ibn Ishaq's book. 12) Abū al-Rayhān Muhammad ibn Ahmad al-Bīrūnī (born 4/5 September 973 in Kath, Khwarezm, died 13 December 1048 in Ghazni) known as Alberonius in Latin and Al-Biruni in English, was a Persian-Khwarezmian Muslim scholar and polymath from the Khwarezm region. Al-Biruni is regarded as one of the greatest scholars of the medieval Islamic era and was well versed in physics, mathematics, astronomy, and natural sciences, and also distinguished himself as a historian, chronologist and linguist. He was conversant in Khwarezmian, Persian, Arabic, Sanskrit, and also knew Greek, Hebrew and Syriac. He spent a large part of his life in Ghazni in modern-day Afghanistan, capital of the Ghaznavid dynasty which was based in what is now central-eastern Afghanistan. In 1017 he traveled to the Indian subcontinent and became the most important interpreter of Indian science to the Islamic world. He is given the titles the "founder of Indology" and the "first anthropologist". He was an impartial writer on custom and creeds of various nations, and was given the title al-Ustadh ("The Master") for his remarkable description of early 11th-century India. He also made contributions to Earth sciences, and is regarded as the "father of geodesy" for his important contributions to that field, along with his significant contributions to geography. 13) Abu Yūsuf Yaʻqūb ibn ʼIsḥāq aṣ-Ṣabbāḥ al-Kindī ‎,( Latin: Alkindus) (c. 805–873 CE), known as "the Philosopher of the Arabs", was an Iraqi Muslim Arab philosopher, mathematician, physician, and musician. Al-Kindi was the first of the Muslim peripatetic philosophers, and is unanimously hailed as the "father of Islamic or Arabic philosophy" for his synthesis, adaptation and promotion of Greek and Hellenistic philosophy in the Muslim world. Al-Kindi was a descendant of the Kinda tribe. He was born and educated in Basra, before going to pursue further studies in Baghdad. Al-Kindi became a prominent figure in the House of Wisdom, and a number of Abbasid Caliphs appointed him to oversee the translation of Greek scientific and philosophical texts into the Arabic language. This contact with "the philosophy of the ancients" (as Greek philosophy was often referred to by Muslim scholars) had a profound effect on his intellectual development, and led him to write hundreds of original treatises of his own on a range of subjects ranging from metaphysics, ethics, logic and psychology, to medicine, pharmacology, mathematics, astronomy, astrology and optics, and further afield to more practical topics like perfumes, swords, jewels, glass, dyes, zoology, tides, mirrors, meteorology and earthquakes. In the field of mathematics, al-Kindi played an important role in introducing Indian numerals to the Islamic and Christian world. He was a pioneer in cryptanalysis and devised several new methods of breaking ciphers. Using his mathematical and medical expertise, he was able to develop a scale that would allow doctors to quantify the potency of their medication. The central theme underpinning al-Kindi's philosophical writings is the compatibility between philosophy and other "orthodox" Islamic sciences, particularly theology. And many of his works deal with subjects that theology had an immediate interest in. These include the nature of God, the soul and prophetic knowledge. But despite the important role he played in making philosophy accessible to Muslim intellectuals, his own philosophical output was largely overshadowed by that of al-Farabi and very few of his texts are available for modern scholars to examine. 14) Khālid ibn ʿAbd al‐Malik al‐Marwarrūdhī .Was a Zanji slave who was taken to Persia in the 9th century. Together with ʿAlī ibn ʿĪsā al-Asṭurlābī in 827, he measured at 35 degrees north latitude, in the valley of the Tigris, the length of a meridian arc and thus the Earth's circumference, getting a result of 40, 248 km (or, according to other sources, 41,436 km). The two researchers measured in Arabian ell, and determined the geographical latitudes of the end points they used from the star altitudes in a celestial horizontal coordinate system. We believe that 1 Arabian ell was 49 1/3 cm. Thus, they found the length of 1° of meridian to be 111.8 km (115.1 km), which differs from the actual value by 850 metres. 15) Ibn Yunus .His name is Apu Omran Kamal al-Din ibn Musa Ben Younes bin Mohammed bin Menaabin Malik Aqeeli.. He was born in 551 A.H-1156 A.D. He died in 639 A.H-1242 A.D. In Al Mowsel city. The favor of being one of the most famous scientists who appeared in his age return to his father who learned him a lot of sciences specially Islamic law sciences. Kamal al-Din was a renowned scholar who had studied principles of jurist-prudence at the Nazimiyya madrasa in Baghdad before he became a teacher of fiqh in the madrasa of his native Mawsil, in northern Iraq. His biography relates that besides the usual religions sciences, his teaching activity included astronomy and mathematics, among others. 16) Abbas Ibn Firnas (810–887 A.D.), also known as Abbas Abu Al-Qasim Ibn Firnas Ibn Wirdas al-Takurini, was a Muslim Berber-Andalusian polymath: an inventor, aviator, physician, engineer, Andalusian musician, and Arabic-language poet. Of Berber descent, he was born in Izn-Rand Onda, Al-Andalus (today's Ronda, Spain), lived in the Emirate of Córdoba, and is reputed to have attempted flight. Ibn Firnas designed a water clock called Al-Maqata, devised a means of manufacturing colorless glass, invented various glass planispheres, made corrective lenses ("reading stones"), devised a chain of rings that could be used to simulate the motions of the planets and stars, and developed a process for cutting rock crystal that allowed Spain to cease exporting quartz to Egypt to be cut. In his house, he built a room in which spectators witnessed stars, clouds, thunder, and lightning, which were produced by mechanisms located in his basement laboratory. He also devised "some sort of metronome." The crater Ibn Firnas on the Moon is named in his honor.